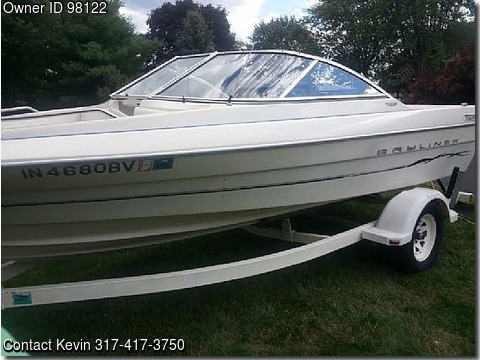 Please contact boat owner Kevin at 317-417-3750. 2001 BAYLINER MARINE CORP CAPRI SERIES 1950 BR CLASSIC BIMINI TOP BOAT COVER 20 FT.- 25 FT. FISH FINDER - MAX DEPTH 600' OUTBD. POWER TILTTRIM50-100 HP PROPELLERSTAINLESS STEEL 3 BLADE SWIM STEP W FOLD DOWN LADDER TRAILER 2001 SINGLE 19 FT TRAILER DISC BRAKES- PER AXLE FENDER- FIBERGLASS SINGLE PER PAIR NEW BATTERY NEW TIRES LOW HOURS NEW AFTER MARKET RADIO SPEAKERS SKI'S LOTS OF LIFE JACKETS SEVERAL INTER-TUBES ROPES.